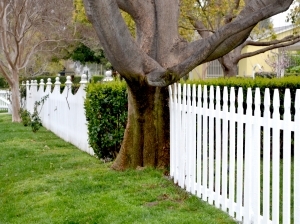 A fence creates curtilage to a dwelling. I wrote an article on the 20 Miles Law Jacksonville lawyers website about a case in St. Augustine FL. This case involved the theft of an expensive, historical bell from the fenced in backyard of a house. If you are not a Florida criminal attorney, you may think that this would just be a Florida grand theft charge. However, it was a burglary because the yard was fenced in. The yard becomes part of the house due to Florida burglary laws. The curtilage of a house includes the areas that are enclosed as part of the house. This includes fenced in areas. Section 810.011(7) of the Florida Statutes defines fenced land. This law states, “ ‘fenced land’ is that land which has been enclosed by a fence of substantial construction, whether with rails, logs, post and railing, iron, steel, barbed wire, other wire, or other material, which stands at least 3 feet in height. For the purpose of this chapter, it shall not be necessary to fence any boundary or part of a boundary of any land which is formed by water.” Section 810.011(8) states, “Where lands are posted, cultivated, or fenced as described herein, then said lands, for the purpose of this chapter, shall be considered as enclosed and posted.” Basically, fenced land is considered curtilage. Curtilage is considered part of the dwelling. This means that if someone enters a fenced in yard and steals something from the yard, this is similar to breaking into the house.